If you care for someone with severe mobility restriction it is advisable to ask their doctor to arrange for a referral to the physiotherapy or occupational therapy (OT) department of their local hospital to advise on what mobility aids can be offered. 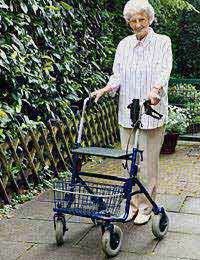 If the person needs a walking stick or a walking frame, the OT department should be able to provide one. But if they need a wheelchair, a further referral will be made to the local NHS Wheelchair Service centre. The wheelchair will be free and fully maintained, although there may be no choice as to which wheelchair is provided. If they would prefer to get the wheelchair of their choice, they may be offered an NHS voucher which can be used to pay for it. If the voucher is not enough to cover the cost, they will have to make up the difference. To facilitate mobility away from the house, they may choose to purchase a scooter. Some mobility scooters will need to be registered with the Driver and Vehicle Licensing Agency (DVLA). It may be worth considering insurance for such a mobility aid. It is not a legal requirement to have insurance for powered scooters, wheelchairs or buggies. But it could be a good idea to have at least public liability insurance, which covers accidental damage to property and other people. If the person you care for only needs a wheelchair or other mobility aid for a short period of time, the British Red Cross may be able to help. It operates a medical loan service which can supply wheelchairs and other mobility aids on a temporary basis. Local councils must offer free off-peak travel on local buses to disabled people living in their area. If the person you are caring for is elderly, depending where you live in the UK, they will be entitled to either free or discounted travel on buses at any time. If the person you care for is registered as disabled or elderly and travels by train, they can apply for either a Senior Railcard or a Disabled Persons Railcard. With a railcard, most journeys are then purchased at a reduced rate. Application forms are available from main railway stations. There are various local transport schemes which rely on volunteer drivers who often use their own cars to provide door-to-door services for older and disabled people. However, if the person you care for is disabled and no longer able to walk great distances, you as their carer, may be entitled to apply for a Blue Badge. The Blue Badge enables people to park for free at places such as pay-and-display bays and parking meters. Furthermore, it enables you to extend your parking time where there is normally a time restraint and on single and double yellow lines. You cannot park in cycle or bus lanes and must abide by all other parking regulations. It does not apply on private land. Applications should be made through your local authority. If you do qualify for a badge, you may also qualify for exemption from paying car tax (vehicle duty exemption).